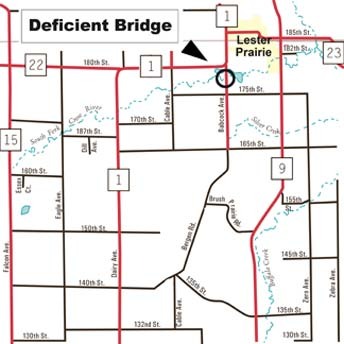 A bridge crossing the Crow River on the south side of Lester Prairie was closed Friday due to “serious deficiencies in the superstructure,” according to McLeod County engineer John Brunkhorst. The bridge, located past the Depot on County Road 84, crosses over the South Fork of the Crow River in Bergen Township. See map. It will be closed over the winter, with local drivers being expected to find alternate routes, since no official detour will be made. In the spring, the county will review options such as opening the bridge up to light vehicles such as cars and pickup trucks, Brunkhorst said. “The decision to close the bridge was made after reviewing the report that was generated following an in-depth inspection that was performed this past fall,” Brunkhorst said. This inspection was performed as part of the statewide in-depth fracture critical bridge inspections that were mandated by the governor following the I-35W bridge collapse. Bridge 5881, which is its official number, is a fracture critical bridge, Brunkhorst said. A contract to perform the design work of a replacement structure was approved yesterday by the McLeod County Board. Bridge engineering consultant Widseth Smith Nolting of Alexandria, MN was the consultant selected. The replacement bridge cost is estimated at approximately $450,000 and is scheduled for 2009, pending a favorable allocation of state bridge bonding funds that may become available this next legislative session. Efforts will be made to accelerate the process for possible construction in 2008, he added. Any questions regarding this should be directed to the McLeod County Highway Department at (320) 234-0234.